Fill out the form below, or call us at 630-551-0334 to get a free design quote. Automotive service companies often face heavy competition. Customers may have numerous options for local auto repair. How do they find you – and then choose you? A website by Weblinx, Inc. sets your auto service business apart. It establishes your professionalism well before a customer picks up the phone. This online impression is vital during the process of elimination. Give your auto service business a web-based advantage. Connect with the many who will make a decision based on what they find online. We can also help more customers find you through specialized search engine optimization. Dellwood Tire and Auto Repair is in business to keep you on the road. Their Auto Service Centers in Lockport and Minooka may assist with brakes, tune-ups, oil changes and more. If you need heavy duty truck tire repair, be sure to visit their Lockport Truck Tire or Minooka Truck and Retread Tire Centers. Their mold cured retreading system offers high performance to decrease your downtime. For auto repair services on engine performance, mufflers, struts, or for light truck and SUV services or truck tire retreads, Dellwood Tire and Auto Repair has three locations staffed with certified technicians to make sure your vehicles are safe when you are on the road. 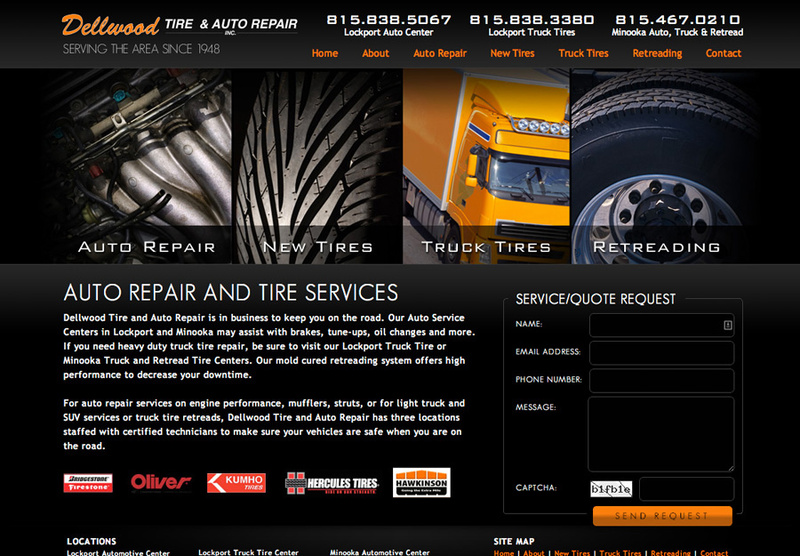 The Dellwood Tire website was developed with the following properties: HTML, CSS, Semi-Custom Design Layout, Tire Tread Search Feature, 5-Community Target Web Market Program, CAPTCHA Secure E-Mail Contact Form. Weblinx is an industry leader providing automotive services web design solutions. Our mission is developing unique sites for Auto Mechanics that create brand awareness and increase the customer base for automobile service companies. Weblinx specializes in web development and digital marketing strategies for the Automotive Services Industry. © Copyright 2018 Weblinx, Inc. All rights Reserved.